Luxury Residence with Spacious Outdoor Living! Nearing completion this mountain modern single family is located on a quiet cul-de-sac in West Vail this home offers an open floor plan, 4 bedrooms, 2 living spaces plus a large 2 car garage. Vaulted ceilings in the great room capture the mountain views while bringing the outside in. 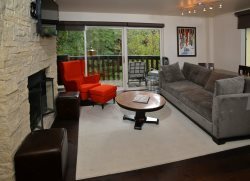 Modern design coupled with spacious outdoor living make this luxury residence perfect for that active local family or that discriminating second home owner in search of a Town of Vail address. What Is a Service Animal Under Colorado Law? The ADA and Colorado law define a service animal as a dog that is individually trained to perform tasks or do work for the benefit of a person with a physical or mental disability. (In some circumstances, a miniature horse who is individually trained also qualifies as a service animal.) The tasks or work the animal does must be directly related to the person’s disability. Vail Village Rentals requires proof or validation from the tenant's medical care provider of the need for such dogs. (service, companion, therapy). an owner is responsible for all damage his/her dog causes to the common area. As noted above, Vail Village Rentals can require the tenants to provide proof that he/she requires a service, companion, or therapy dog. Expectable forms of proof consist of a letter from a licensed medical doctor confirming the type of dog, or a specific dog, needed to accommodate a homeowner's disability. If a tenant is unwilling or unable to provide proof of his/her need for a reasonable accommodation, Vail Village Rentals could prohibit the dog unless and until proper evidence of a need for a reasonable accommodation is received.